In June 2013, TDSB Director of Education Donna Quan requested the Ministry of Education conduct a forensic audit to address concerns raised about accountability and the use of funds in specific areas of the Board. 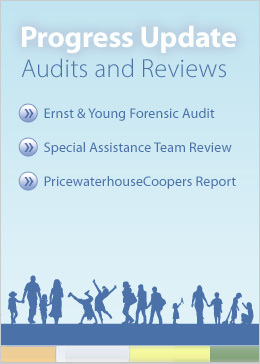 Read more about the forensic audit. In June 2012, the Board asked the Ministry of Education for a deep operational review to help determine best practices for an organization of our size. The review looked at looked at several departments within the TDSB — including Facility Services, Construction, Finance and Human Resources — to find efficiencies on both the operational and financial side of things. The PricewaterhouseCoopers (PwC) report makes a number of recommendations on accountability, operational leadership and controls. Since receiving the report, we’ve been moving forward with the recommendations to help strengthen operations. This chart has been created to provide an update on where we are with the recommendations. For six months in 2013, a Special Assistance Team (SAT) appointed by the Ministry of Education worked with the TDSB to implement the recommendations from the PwC report and address the Board’s structural and capital deficits. The SAT report details the progress made during this time and lists further opportunities for improvement. Since receiving the PwC and SAT reports, we have made a number of improvements and are committed to continuing to bring new changes forward. After receiving the report, the Ministry of Education lifted the TDSB's capital freeze, enabling us to move forward with our priority projects based on our balanced three-year capital plan. A review of the TDSB’s Professional Support Services (PSS) department was conducted by Deloitte between June and December 2011. After the review, a final report containing 20 formal recommendations and 37 total recommendations was presented to the TDSB. The PSS department has made a number of changes to address each recommendation and improve service supports for students. The PSS status chart provides a complete list of progress to date for each recommendation. Blackstone Partners conducted a review of the TDSB's Facility Services department in 2007. The Blackstone report provided recommendations on improving operations within Facility Services to increase efficiency and effectiveness. In March 2011, staff provided an update on the status of implementation of the recommendations from the Blackstone Report.